Sometimes the best things are the simplest. For years my mom has told me to rub half a fresh lemon on my face to get rid of blackheads and pimples. Though I hardly did this, I recently found myself in desperate need of a good cleanser. Since the usual facial cleansers aren't doing it for me these days, I've incorporated a simple lemon into my regimen with positive results. So why are lemons amazing? 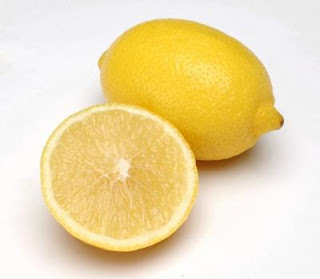 One reason why using a fresh lemon is better than a topical product with vitamin C has everything to do with potency. Vitamin C is most beneficial when it is not exposed to air and light. Because the lemon is used fresh, you get the benefits immediately and can be certain that it is present. Plus vitamin C serums are super expensive. Another benefit is that it cleanses surprisingly well. I like to use it just before bedtime. If I hadn't worn make-up or anything particularly difficult to remove I use it alone or after soap as a toner. Step 1: Rub it on face. Step 2: Let it dry then rinse it off. I will reuse the same half a lemon for a couple days (storing it in the fridge) before throwing it out. Then use the other half. One lemon can last me a week. Depending on my skin situation I might use it up to 4 days -- but not consecutively. If you can't use the whole lemon, no worries! Drink the other half in tea. Lemon water is also amazing for skin and general well-being. The pH issue is important too. Skin generally has a naturally acidic pH (just like hair) so the best cleansers are also slightly acidic. Since most soaps are alkaline, most soaps actually could have the potential to cause problems with skin. Since a lemon is already acidic, it pretty much works in harmony with skin. Well my skin. Be mindful that a lemon has a pH between 2-4 and skin is usually about a 5. A lemon is still more acidic than your actual skin is, so it is not something you want to do daily, and a side-effect can include some tingling, irritation and redness. If your skin is sensitive, it might be worthwhile to rinse off the lemon juice quicker (don't wait for it to dry) and limit use to once a week. Regardless of your skin type, a good moisturiser or a light vitamin E rich oil afterwards is a must.